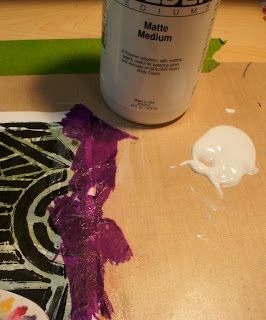 It's time for Artsy Fartsy Friendly Fun with Carolyn! Yes, it has been 4 weeks. I was traveling in the last two weeks and wasn't able to keep my Artsy Fartsy committment last time. Missed it so much! If you missed our last Artsy Fartsy Challenges you can click on the label on the side bar. So what was our challenge this time?? This one came pretty fast to me. 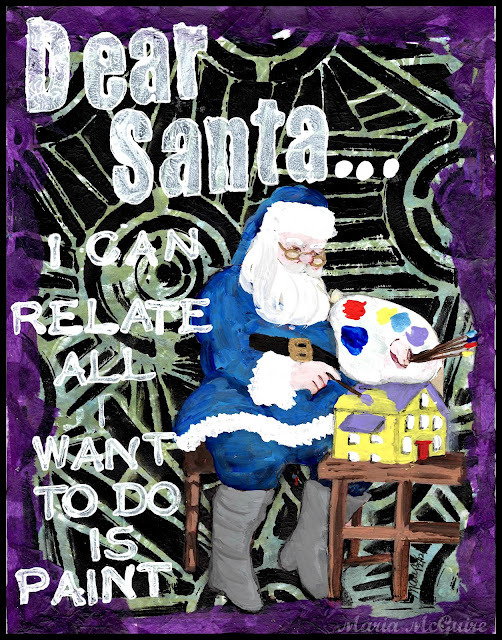 I had a royalty free image of Santa I was dying to use so today was the day! 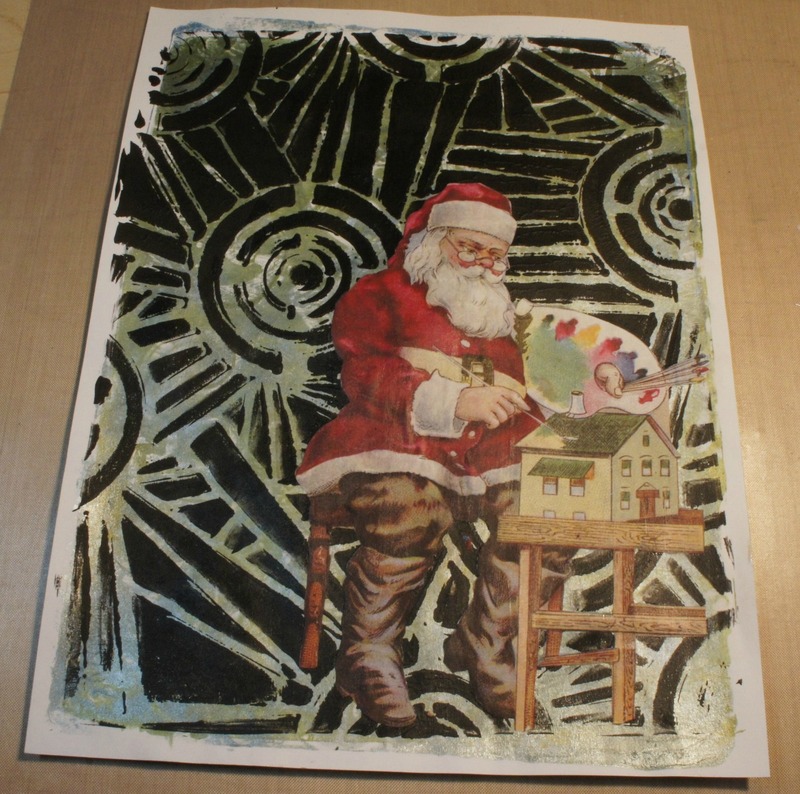 I started with a print I had made on my Gelli Plate--I seem to be saying that alot lately :) Seriously, if you don't have one you might want to consider a last minute call to Santa! 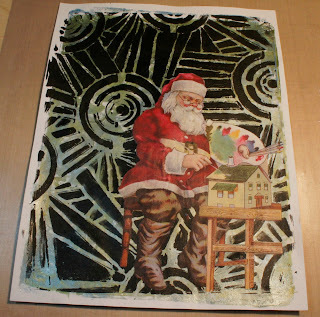 Please don't tell Santa--but I sort of sneaked and used my new 12" x 14". 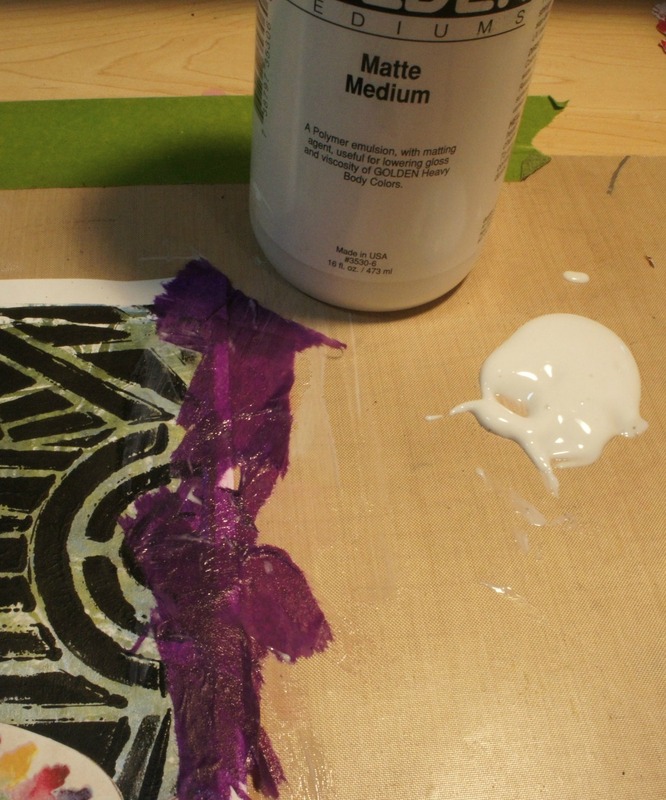 So Gelli Arts if you get a call from a guy saying he thinks he got a defective one just say that you test them before you send them out--okay????? 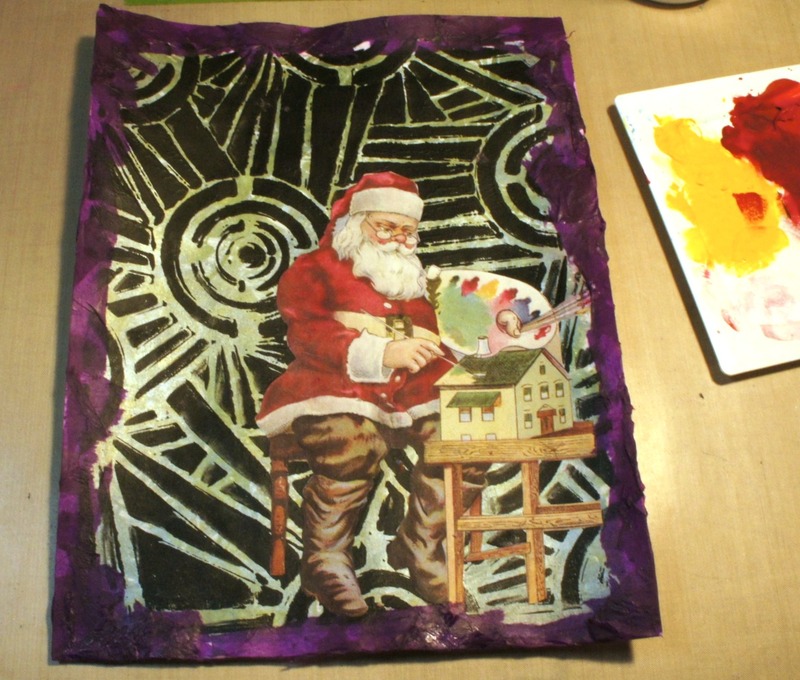 I then added my image of Santa I copied with regular printer paper with Matt Medium. 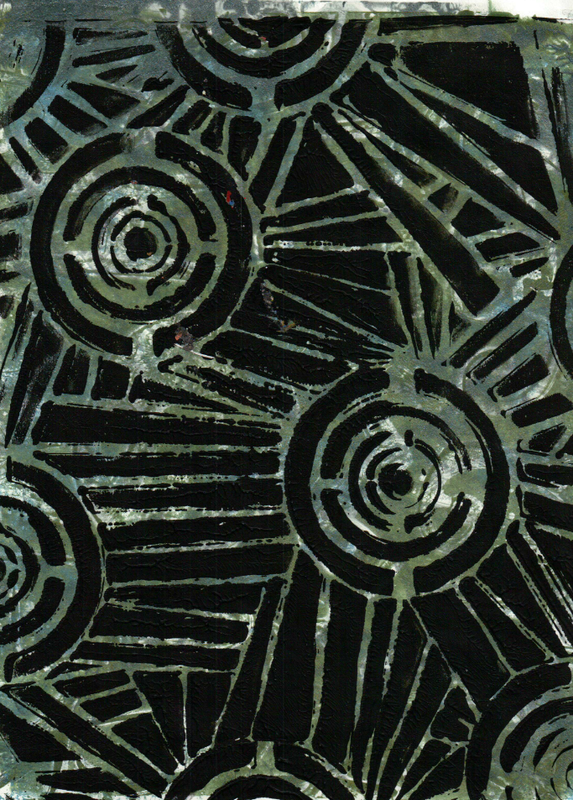 For some reason I don't like what it looks like when I just add images to my work. I like when other's do it, but some reason when I do it...it just looks wrong to me. Tissue paper....I had an idea but it just didn't seem right so I'll save that for another day. A border--yes a border!!! No hard techniques here. Just rip and glue with Matt Medium. Note the non-tradtional color! Now how to make it my own. 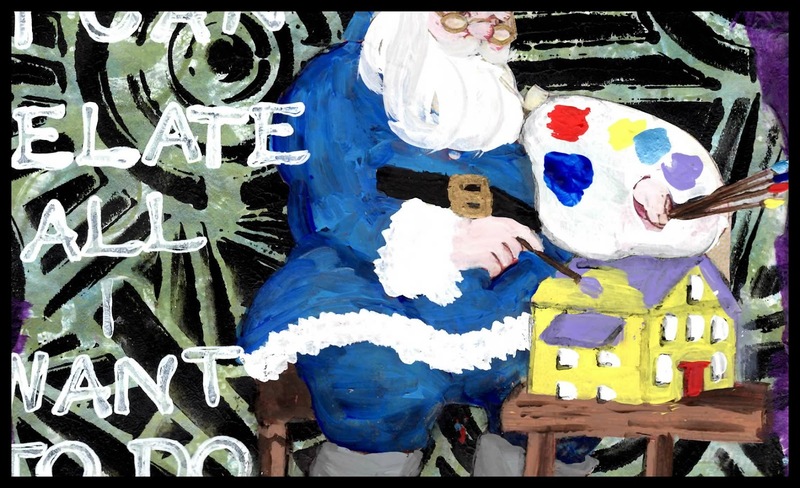 Santa got a new suit (in a non-traditional color I might add) and with some more fun painting and lettering it was done! So, so FUN!!!!!! Now it's time to go see what Carolyn did! 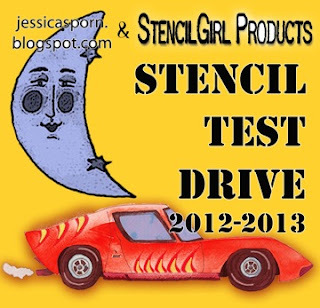 Come back and visit both of us to see what we did with one of Jessica Sporn's new stencils from Stencil Girl. I want that Santa! He was nice before but once you added your paint and that blue -he is amazing! 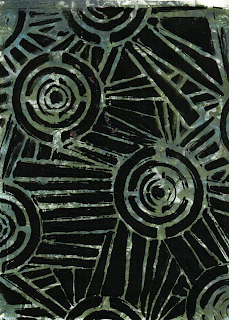 You know I've been saying that Gelli plate thing a lot too! I am right there with you - lets all just paint!! Great project Maria, I like the non traditional, bright colors! Oh I agree, I never like it when I add pictures to my pages...but it always looks great on the pages of others...like yours...what a great idea to paint it!!! I will have to remember that. Really a fun solution - very non-traditional, but so fun. This is so much fun. Love the black "spooky" background and how it became the perfect setting for your Santa. I think he looks great in blue too! What you wrote is so true of us all I think! !